Mr. LIU Xiaobo died on July 13th under the strict control of the Chinese authorities. After his passing, his body has been cremated very quickly, and his ashes scattered to the sea, making it difficult for the public to mourn him. The Chinese government has also put his family members under tight surveillance, stopping them from contacting the outside world. Citizens mourning LIU Xiaobo have faced severe reprisals. Since LIU Xiaobo was awarded the Nobel Peace Prize in 2010, LIU Xia has been subjected to illegal house arrest, harassment and strict surveillance by the Chinese government. She has been forbidden to contact anyone except a few friends and relatives, which causes her to suffer from severe depression; at the same time she also has heart disease. Since LIU Xiaobo’s sea-burial on July 15th, LIU Xia has been unreachable by the outside world; not even family member can contact her directly by phone. The Chinese government has also brutally suppressed Chinese citizens who mourned LIU Xiaobo. Supporters from across the country have faced short term detention. The most severe crackdown had occurred in Guangdong; on the seventh evening of Mr. LIU Xiaobo’s passing, about a dozen citizens held a memorial by the seaside in Xinhui, Guangdong. Two days later, the police launched a massive search and arrest effort targeting the participants. So far six people have been placed under criminal detention, namely WEI Xiaobing (卫小兵), LIU Guangxiao (刘广晓), LI Shujia (李舒嘉), HE Lin (何林/何霖), WANG Meiju(汪美菊/汐颜), and QIN Mingxin(秦明新). They are detained in Guangdong Jiangmen City Xinhui District Detention Center. Till now the investigation is still ongoing; several participants have their house searched, and even the Guangzhou driver employed by Hong Kong Cable TV, which had made a live broadcast of the memorial, had also been briefly detained in Xinhui Detention Center. The driver was only released under strong public pressure and criticism after his case had been widely reported. Being the wife of Liu Xiaobo, as well as a person with independent thinking, were Liu Xia's only "crimes"; as was daring to express their support and grief for their fellow citizen was the only "crime" of the Guangdong six. 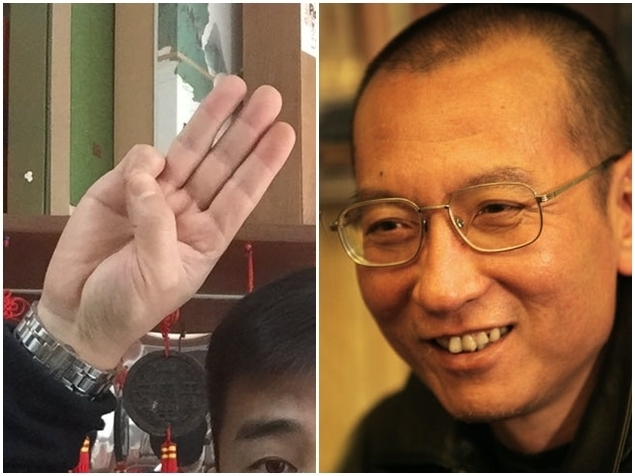 The hypersensitivity and absurdity of the Chinese government have been revealed by this series of guilt by association cases surrounding LIU Xiaobo. How could the departed rest in peace while the living are not free? The Chinese government must stop the illegal house arrest, harassment, and surveillance of LIU Xia. Immediately release the six mourners, namely WEI Xiaobing (卫小兵), LIU Guangxiao (刘广晓), LI Shujia (李舒嘉), HE Lin (何林/何霖), WANG Meiju(汪美菊/汐颜), and QIN Mingxin(秦明新). The freedom of expression of Chinese citizens must be protected. Stop suppressing the mourning and commemoration of Mr. LIU Xiaobo. Free LIU Xia and the citizens.